Upon the request of the Municipality of Herceg Novi, the Union of Municipalities, in cooperation with the Human Resources Authority Management, organized training on the topic of “Development and implementation of EU projects”. The training is being implemented in two parts, each lasting three working days. The first part of the training was realized in Igalo from 4th to 6th November 2015. The new Law on Administrative Procedure was presented on three training for local civil servants and employees organized during the month of July by the Human Resources Management Authority and the Union of Municipalities. The two days training was organized in Bijelo Polje for the municipalities of the northern region (08 and 09 July), then in Tivat for coastal municipalities (16 and 17 July), and finally in Podgorica for the central region (21 and 22 July). Three regional training on this issue were organized in Podgorica on 25 March, in Bar on 1 April and in Bijelo Polje on 6 April 2015. The target group were municipal secretaries and serevants of the Secretariats of Finance, as well as employees in other municipal secretariats and municipal budget funds beneficiaries participating in the planning and execution of the budget. The trainings were attended by 43 participants in total. 23/03/2015 – During the previous week, the Strategy for the Professional Development of Local Civil Servants and Employees as well as the Action Plan for the Strategy implementation were presented to the high-officials of all local government units in Montenegro. The first presentation was organized in Podgorica, for the officials of the central region, then in Bar for municipal civil servants in southern region and finally in Bijelo Polje for the municipalities of the northern region of Montenegro. 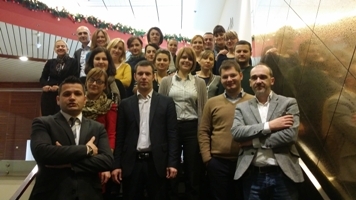 Training on the topic “Development and Management of the Projects” took place from 24 to 26 December 2014 and from 14 to 16 January 2015 in Bijelo Polje. Training was organized by the Union of Municipalities of Montenegro, with the support of the Human Resources Management Authority, at the request of local governments from northern region of Montenegro. The aim of the training is to improve the capacity of local governments in the northern region of Montenegro for the preparation and management of projects financed from IPA funds. 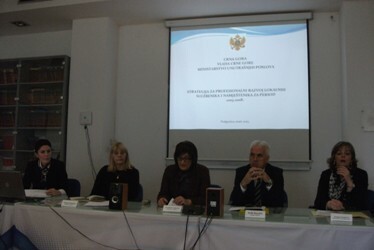 The six two-day workshops on the topic “Implementation of the Law on Spatial Planning and Construction in Local Government” were organized by the Union of Municipalities of Montenegro, Ministry of Sustainable Development and Tourism and the OSCE Mission to Montenegro, in the period October-December for all local self-government units. A three-day workshop and plenary meeting of the Network of municipal project managers were organized in the period from 10 to 12 December 2014 in Budva. The meeting was organized by the Union of Municipalities of Montenegro and the Technical Assistance Project “Local government capacity building in the implementation of municipal development grants” funded by the European Union. 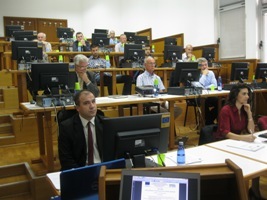 The Faculty of Mechanical Engineering in cooperation with the Union of Municipalities of Montenegro organized the second pilot course “Management of the Renewable Energy Sources”, on Friday October 10th 2014, in the building of the Technical Faculty in Podgorica. This course is being implemented within the TEMPUS project SD TRAIN (Training courses on sustainable infrastructure development for public services in the Western Balkans) funded by the European Union. 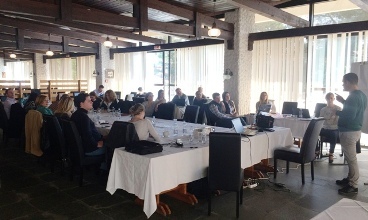 Two trainings on “Evaluating and rewarding local civil servants and employees” were organized by Union of Municipalities of Montenegro and the Human Resource Management Authority, in accordance to Training plan for local self-government for April-July 2014. Trainings were organized for the Central region on September 23rd in Podgorica, and on October 3rd 2014 in Budva for the Southern region. Three trainings on “Legal and Technical Drafting Rules” were organized the Human Resource Management Authority in the partnership with the Union of Municipalities on 24 April in Bar for municipalities of the Southern Region, on 16 May in Podgorica for municipalities of the Central Region and on 3 June in Bijelo Polje for municipalities of the Northern Region. Targets group were heads and employees in local administration bodies in charge for legislation drafting. The trainings main goals were to introduce legal and technical drafting rules to municipal leadership and local civil servants and employees.